This author poses a question for all Americans to think about. Is our justice system compromised for rich and powerful people who commit criminal offenses? It is a sad reality that though Hillary Clinton committed felonies, she was found innocent by FBI Director, James B. Comey, who led the investigation of her use of personal e-mails during her time as Secretary of State. Below are two of many felonies committed by Hillary Clinton and do not include her play-to-pay communications with foreign entities. The felonies are defined under Title 18 U.S.C. Crimes and Criminal Procedure. The above felonies were committed by Hillary Clinton in her deletion of over 33,000 e-mails and destruction of an unauthorized server, computer and i-Phones. It is evident that the e-mails included classified material and evidence of culpable play-to-pay schemes with foreign entities that provided millions of dollars to the Clinton Foundation. It is a mockery of our justice system that the FBI conducted an investigation instead of a criminal trial with the amount of overwhelming evidence destroyed by Hillary Clinton. The common man or woman would be put in jail for destroying evidence. General Petraeus was prosecuted and convicted for doing one-tenth of Hillary Clinton’s alleged felonies, how is it possible for her to be judged innocent of such obvious crimes? In July of 2016, FBI director Jim Comey announced he will not change his decision of innocence of any felony charges dealing with Hillary Clinton’s emails. This was a shallow and superficial investigation led by the Justice Department. The integrity of the FBI is now being questioned as another, even more grievous felony was committed by Hillary Clinton during her campaign for the presidency. In an attempt to defame and disparage the character of Donald Trump in his bid for the presidency, both the Hillary Clinton campaign and the Democratic National Committee funded more than 5 million dollars for research that went into compiling the Christopher Steele Dossier, also known as the Russia-Trump Dossier. The dossier contents contain fake allegations of misconduct and collusion between Donald Trump, his campaign, and the Russian government prior to and during the 2016 U.S. presidential election. Another nefarious crime under Hillary was her approval of 20 percent of America’s uranium supply while Secretary of State. Between 2009 and 2013, Russia donated many millions of dollars to the Clinton Foundation to make the deal. Peter Schweizer revealed in his book Clinton Cash, that the Clinton Foundation was given 146 million dollars for Hillary Clinton’s permission to sell American uranium to Russia. Judge Pirro went on to say that special counsel Robert Mueller and deputy attorney general Rod Rosenstein need to “be fired immediately” for the handling of the Hillary Clinton email scandal and uranium one deal; adding former FBI director Jim Comey needs to be investigated for his role. Will the American Justice System impose no punishment for Hillary Clinton’s grievous felonies? Simply because Hillary Clinton ran for the presidency should not give her a free pass. 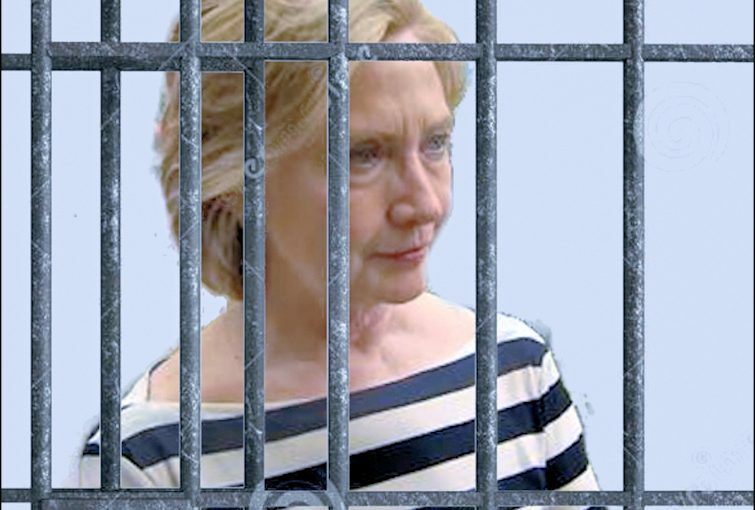 Perhaps, the Political Establishment does not want Hillary jailed because it may be an embarrassment for the Democratic Party and millions of Americans that voted for Clinton. What should be of greater concern is that equal justice under the law be applied to Hillary as it is for any American. To not lock up Hillary Clinton would be a failure of not only our Justice System but a poor reflection of the integrity of our American system of Government. Is our Government so corrupt as to let obvious felonies go unpunished? Have our values depreciated to such a level that we are unable to adhere to the principles of honesty and truth? Presently, American media reflects progressive thinking that does not support the morality of our people. This may be why so many Americans still support Hillary Clinton even with outright evidence of her criminal behavior. Should Americans blame the News Media for shaping our values with FAKE NEWS that distorts the truth and misinforms the American people because of party affiliations? It appears that many journalists are not interested in reporting honest and factual news but to indoctrinate the American people with values that do not enforce the attributes of integrity. A plausible reason why many journalists have compromised their reporting of the truth is that our universities have been taken over by progressive thinking that does not support the principles of morality that our country was founded on. With an optimistic view, this author believes that Americans “see” and understand “the fake news phenomenon.” This was verified with their election of Donald Trump for President. They will continue to rise above the stupidity of reported fake and misleading news. The American spirit will be uplifted when Hillary Clinton will be prosecuted to pay for her crimes. A press release of this article was placed on the Internet and may be viewed via: http://www.einpresswire.com/article/413636803/jail-hillary-clinton.